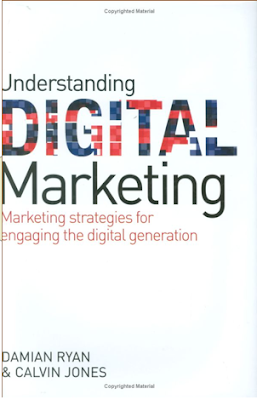 Calvin Jones kindly offered me a copy of his latest book 'Understanding Digital Marketing' a couple of months ago. I've been juggling a few books related to digital marketing recently. Not sure when we all stopped talking about 'online marketing', and moved to the word 'digital'. But given the real convergence happening these days between different devices, I suspect it is a more accurate word. Calvin and fellow author, Damian Ryan, cover a fair bit in this book. In my view, their book is not really for marketers already using digital or working in agencies. It is pitched at marketers unfamiliar with this world - thus the word 'understanding' in the title I assume. It would also be useful to small business owners. It is quite a practical guide. Spanning just over 250 pages, they introduce the reader to website design, usability, email marketing, search marketing and much more, including a few chapters on the more recent social media tools. They also mix in both Irish and global case studies. The guys are at pains to point out that, like any marketing expenditure, you figure out what you want first before jumping into any of this. While I'm not the target audience for this book, I know a few marketers that are.